Vignetting is due to the optical effects of a lens. It's where the corners and edges are darker than the center due to the way the light is transmitted through the lens's glass. It's most obvious in areas that you'd expect to see even tones, like blue skies. The amount and even precise shape of vignetting varies lens to lens. It typically tends to be strongest with the aperture wide open (ie. wide aperture, low number such as f/1.8). Here's an example, with all the right conditions to show vignetting: smooth blue skies, a long telephoto (600mm), and a wide-open aperture. 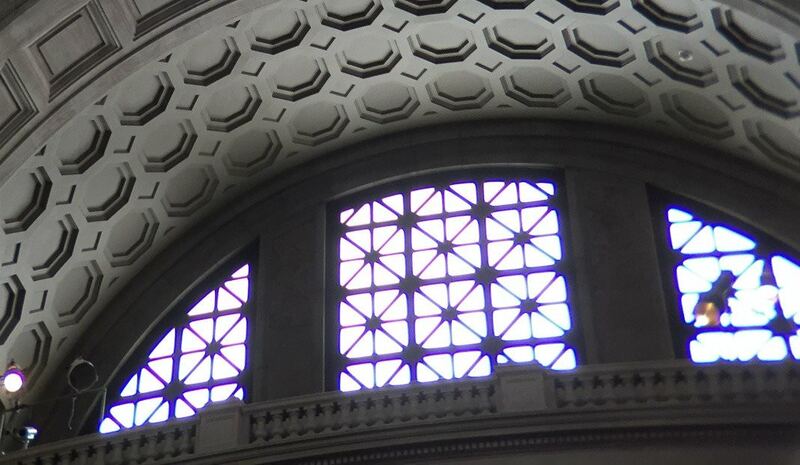 When you look at the original photo by itself, you can certainly see that it's darker at the edges than at the center. But it's when you compared it to the corrected version that the vignetting becomes even more obvious. It's worth emphasizing that there are no exposure, brightness, contrast, or other settings changed between these images--it's purely the vignette correction. While it's technically a flaw, unlike chromatic aberration or purple fringing, lens vignetting is not always a bad thing. In fact, there are many cases where I actually prefer a bit of subtle vignetting to help draw the eye toward the subject of the image. It's simply a matter of creative judgment. But there are definitely times that lens vignetting detracts from the image. So there are times you might want to reduce it or try to eliminate it entirely. 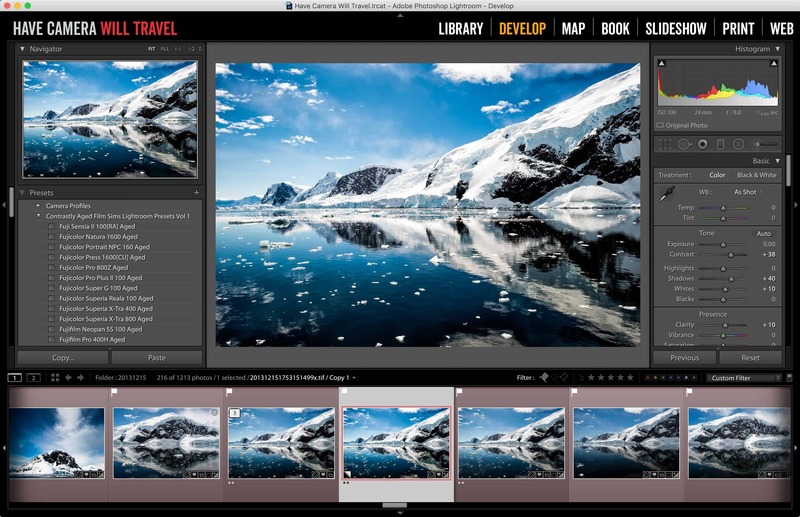 So here are two ways to do it through Lightroom. Both of these use the Lens Corrections panel. 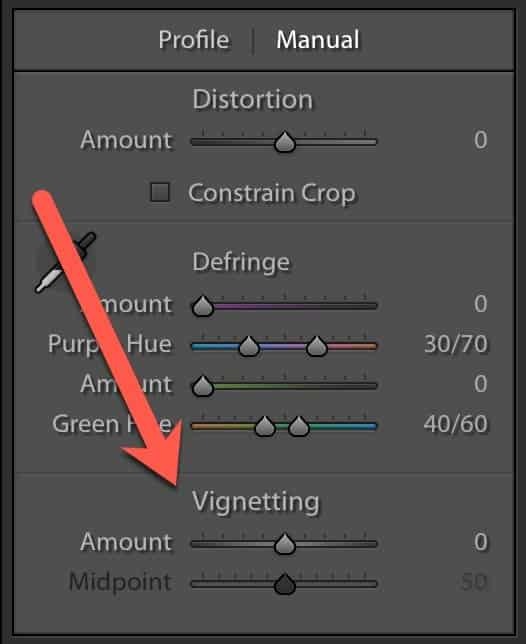 There is a third way to control vignetting in Lightroom, but it's designed more for creative effects rather than correcting lens vignetting and operates a bit differently (it's under the Effects panel). This is the best option in most cases. It applies a pre-configured profile that matches your specific lens. It works because vignetting is one of those optical characteristics that tends to be relatively consistent across different samples of the same lens. So even if the automatic correction isn't perfect every time, it gets you a good way in the right direction. You can then tweak the results. The tools to do this are in the Develop module under the Lens Corrections Panel on the right, towards the bottom. If that particular panel isn't expanded, click on the small triangle to the left of the panel title. At the top of the panel, you have tabs for Profile and Manual. Make sure the Profile one is highlighted, or click on it. Next, check the box next to Enable Profile Corrections. 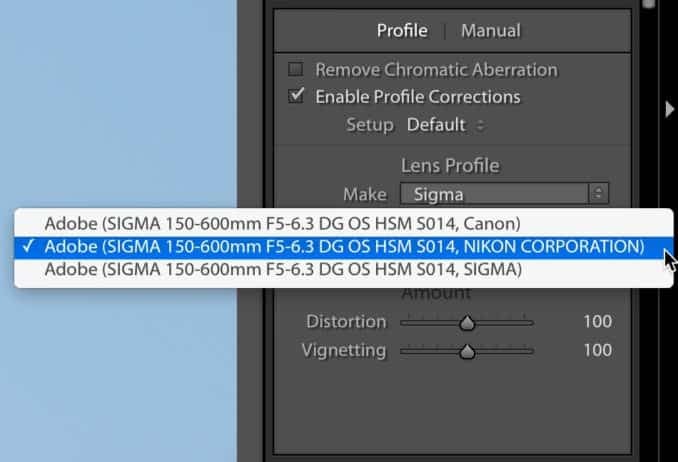 If there's a matching profile already for your lens, it should detect that automatically from the image's EXIF information and automatically choose it. In some cases, there might be more than one profile for a specific lens. One might have been made by Adobe and another by the manufacturer, for example. You might also notice a slight shift in perspective when you check the Enable Profile Corrections box. That's the Distortion correction kicking in. It's designed to correct the optical distortion of the lens. In this example, I've disabled it so as not to complicate matters for the illustration. I find that the supplied profiles do a pretty good job right out of the box. But there are inevitably slight variations between samples of the same lens, and also in camera combinations and shooting conditions. You also might decide that you want something that's not all on or all off. That's where the slider comes in. By default, the Vignetting slider starts in the middle at a setting of 100. You can use that slider to tweak the results, perhaps applying a more subtle correction while retaining a little vignetting (slide left, or numbers under 100), or maybe being more aggressive and lightening the edges even more (slide right, or numbers above 100). 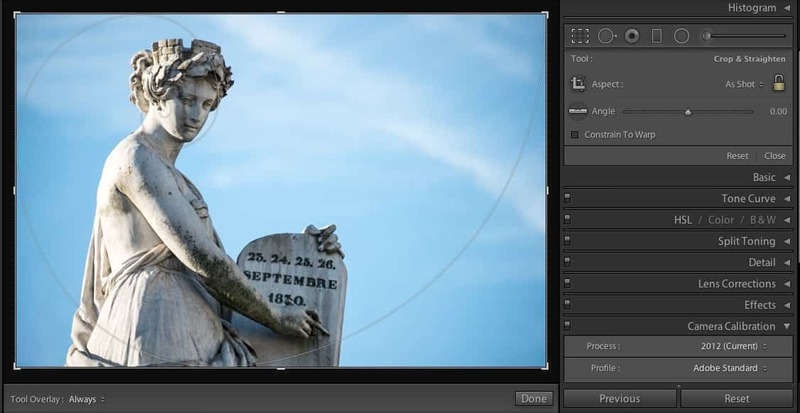 Tip: A quick shortcut to reset back to 100 is to double click on the word "vignetting" next to the slider. 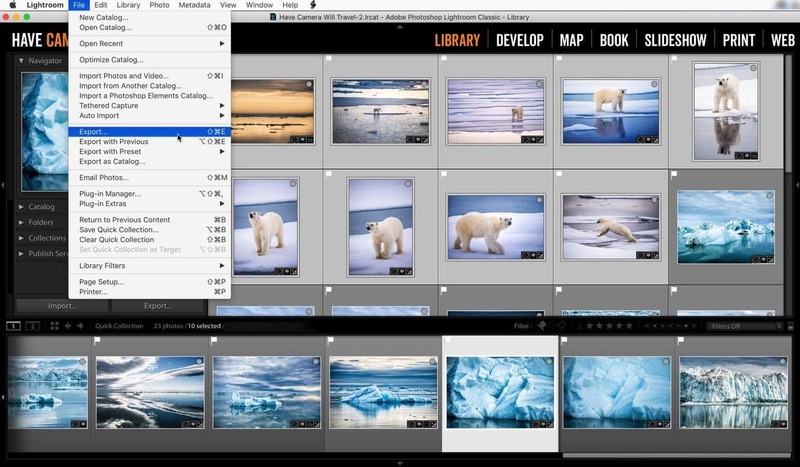 If you want to apply the same settings to multiple photos, make sure they're selected in the filmstrip at the bottom and then hit Sync (or right click > Develop Settings > Sync Settings or SHIFT-CMD-S (Mac) or SHIFT-CTRL-S (Windows)). 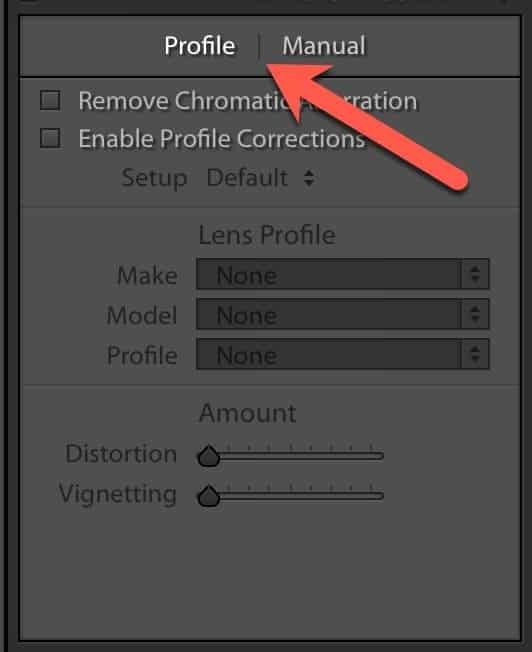 The automatic lens profile corrections work well when there's a matching profile in Lightroom for your lens. If there's not one already, you can make your own, but that's a relatively slow and involved process. If you don't have the patience or inclination to make your own, there's a quick way to get a similar effect. It's not as customized for your specific lens, but you do have control over another important aspect of the vignetting that you don't under the automatic profile approach. 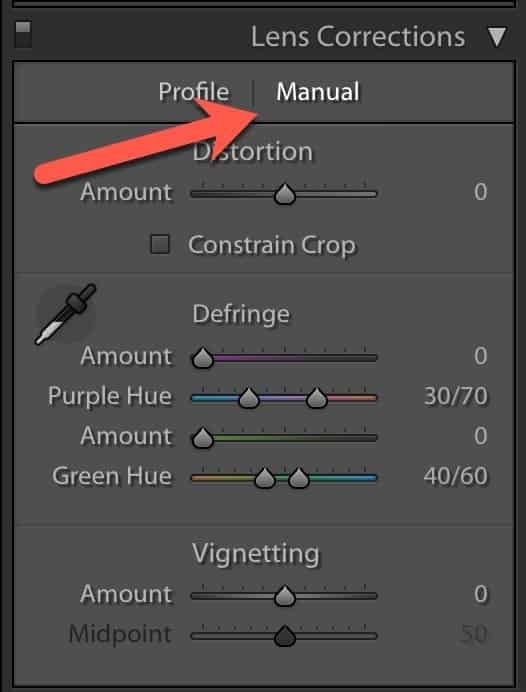 Instead of making the Profile tab active, click on Manual. This will switch to manual controls. At the bottom of this section are the vignetting controls. The top slider controls the amount. The one below it controls the midpoint. It will be grayed out at first but become active once you move the vignetting amount one way or the other. Slide it to the left, and it will darken the edges and exaggerate whatever lens vignetting was already there. This, for example, is what it looks like at -100 (unlike the sliders in the automatic profile correction tab, the amount slider here starts in the middle at 0 rather than 100). As you can see, neither of those extremes solves the problem, but sliding it to the right and lightening the corners and edges is the direction we want to head. So I'll scale it back a bit so that the effect is less dramatic and more natural. What I'm trying to find is the sweet spot just before the corners starting getting lighter than the overall tone. In this case, I put it at about +29. But that's still not quite right. While most of the blue is now more even than it was, there's still a brighter area in the middle, behind the plane. That can be improved using the midpoint slider. It works a bit like narrowing or broadening a flashlight beam. In this case, sliding it to the far left spreads it out so that it's more evenly gradiated. It's not perfect--there's still a dark area in the bottom right corner, for instance. But it's a good improvement. The ability to eliminate or minimize lens vignetting comes in especially handy when stitching panoramas. Without it, you can end up with some ugly, uneven seams where the stitched images are joined. Some panorama stitching software has vignette correction as a built-in feature, but others don't. 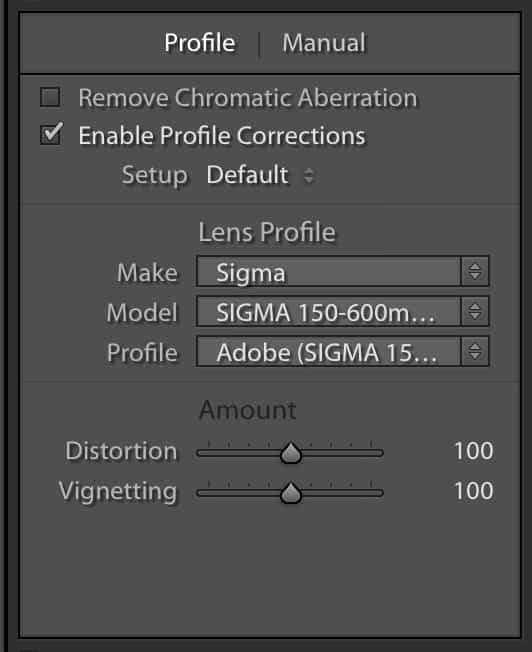 But even with those that do, Lightroom's lens vignetting correction is often better and more flexible. Good explanation - thank you. It is important to remark that some RAW file types include detailed information on the lens' properties - this automatically leads to a corrected photo (which is quite annoying). One such example are Panasonic .RW2 files. If one would like to work with them without automatically applied correction then - to the best of my knowledge - Lightroom cannot be used (I am at least not aware of a switch that would turn the correction off).